Another Monday, another puzzle of the week. But first, to last week’s winner. 21. 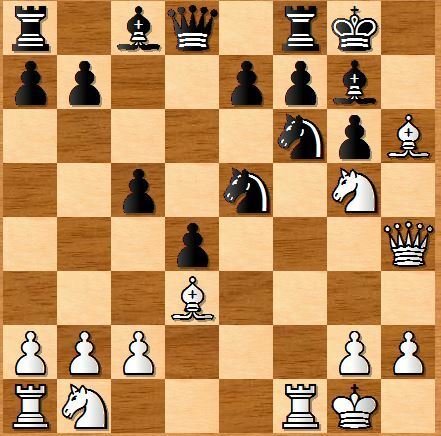 Rxf3, Nb4 and white resigned due to 22… axb4 (or cxb4), Ba4 with mate in max 4 moves. Very pleasing, and I think John White takes the plaudits this time. Well done, John! 1 Rxf6 exf6 2. Bg7 is threatening mate on h8. Otherwise it is mate on h7 by Wh Q. Same reply to 2… Bxf6 apparently. Hope there will be something more difficult to crack in the next batch of puzzles. Correction: Mortensen – Karlsson was played in 1988 not ’98. My typo not the webmasters I hasten to add!